IN THE guise of green energy production, large-scale land transactions are taking place in Attappady, a backward tribal area in Kerala's Palakkad district. 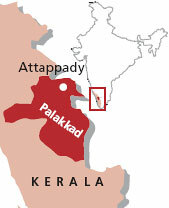 On August 8, district collector K V Mohan ordered the village administration in all six villages of Attappady to submit details of the land deals since January 2006. Earlier, in a report submitted to the state government in July end, the district collector had recommended a detailed investigation of the land deals by Sarjan Realities, a Pune company that buys land and installs windmills for the multinational Suzlon Energy. The report drew attention to the illegal possession of tribal and forestland. In 2007, Sarjan Realities started buying land in Attappady in the Nilgiris Biosphere Reserve. It is the only block in Kerala under the government's Integrated Tribal Development Project (ITDP) and home to 6,000 tribal families. Sarjan Realities installed 33 windmills with a total capacity of 20 MW in Kottathara, Sholayur and Agali villages with the sanction of the Agency for Non-conventional Energy and Rural Technology. Following media reports of largescale illegal land transactions, Attappady's ITDP officer conducted a preliminary inquiry and submitted a report to the district collector on May 17. This report stated Suzlon was buying and encroaching upon tribal land to lay roads that will transport huge blades and other components needed to erect wind towers. The report also mentioned that more than 60 hectares (ha), where the company has put up 12 windmills, belonged to 36 tribals who were paying tax for the land. While Sarjan Realities maintains the 261 ha it has bought has been from nontribals, the ITDP report gives details of the tribal land it bought. Rangan, a tribal, said he sold 2.8 ha for `42,000. In many cases, the tribals were made to believe they were giving their land on lease. Some of them got `12,000 for giving land for what they were given to understand as widening of panchayat roads, the ITDP inquiry revealed. Following this inquiry, the revenue divisional officer (RDO) of Ottappalam verified 52 land registrations done in the past two years in Kottathara village; he found Sarjan Realities and 29 individuals bought 105.2 ha, of which 72.8 ha originally belonged to tribals; 17.09 ha was forestland. The company then sold 23 plots of 0.48 ha with a windmill in each plot to other business houses including Poppy Umbrella Mart, Anna Aluminium, Bhima Jewellery, Kerala Steel Associates and Mumbai's Asian Star Company. "We have examined land records of only Kottathara village," Mohan said. 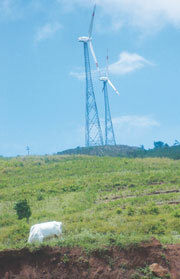 "There are windmills in the other two villages as well. Tribal land may have been appropriated there too," he added. Activists said the company's largescale purchase gave birth to a land mafia. "Middlemen buy land from tribals at very low prices or they grab land by forging papers. Then they transfer it to the companies," said Sukumaran of Adivasi Samrakshana Samithi that works for the rights of tribals. The RDO's inquiry also revealed forgeries in connivance with officials of the Revenue and Registration department and Attappady Hills Area Development Society, an autonomous institution of the Rural Development Department. In many cases, fake documents were prepared to bypass the Kerala Restriction on Transfer by and Restoration of Lands to Scheduled Tribes Act, 1999, that prohibits sale of tribal land to non-tribals.